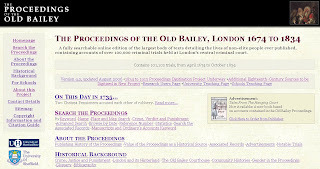 For those of us with Black Sheep in our family in London, The Proceedings of the Old Baily, London is a website that provides digitized documents with transcription of these documents in a database that is search able by name, keywords, location, crime, verdict and sentence. The crimes range from murder, treason, religious crimes and many other crimes that were brought to trial such as thievery. Even if you do not have any "Black Sheep" in your family, this site provides and interesting insight into the time periods that these records cover. The database has over 100,000 trials ranging from April 1674 to October 1834. The project staff are currently digitizing and indexing the trials from December 1834 to April 1913 for this Old Bailey Court which was renamed to the Central Criminal Court. The projected completion date for the digitization and indexing of these records is September 2008. If you would like to visit this site, click here.